I'm interested in possibly adding an open loop "beam" scanner to my projector plan, similar to the "Skyman" product offered by Technical Artisans. I'm looking for something I can modulate with an audio signal or by "manually" varying a 5VDC input voltage. 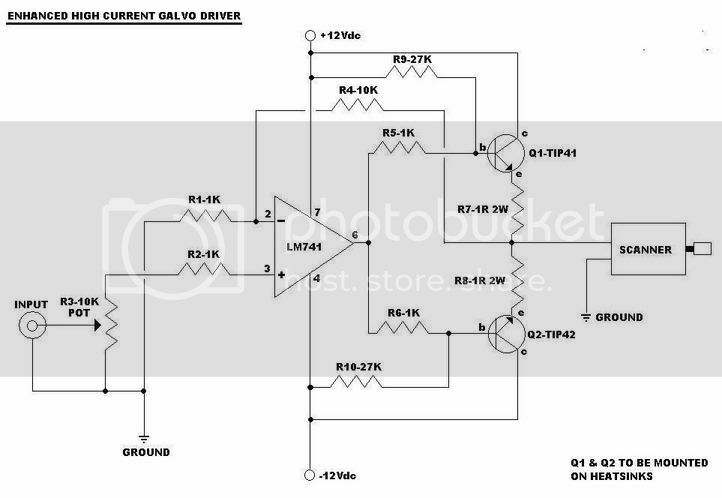 Can anyone recommend a source for a comparable REASONABLY-priced galvo and driver circuit? I would also be interested in a source for REASONABLY-priced TTL-triggerable actuators to be used for beam routing. Unfortunately, I still don't have access to an Internet connection that allows me to search Ebay - hence, the questions! by far the most shows i have done have been dmx controlled. not that you are planning on using dmx, but one feature i like in my dmx setup and that i miss having in my computer controlled set up is the ability to run a signal from the djs mixer right into the board controlling the laser. i am able then to adjust the input on the dmx's audio slider and i can get really nice results. and that's just with a clunky motor actuated beambox. i think it would be sweet to have direct music signal to a computer based system giving you the chance to make your beam show dance with the beat and not just on the beat.